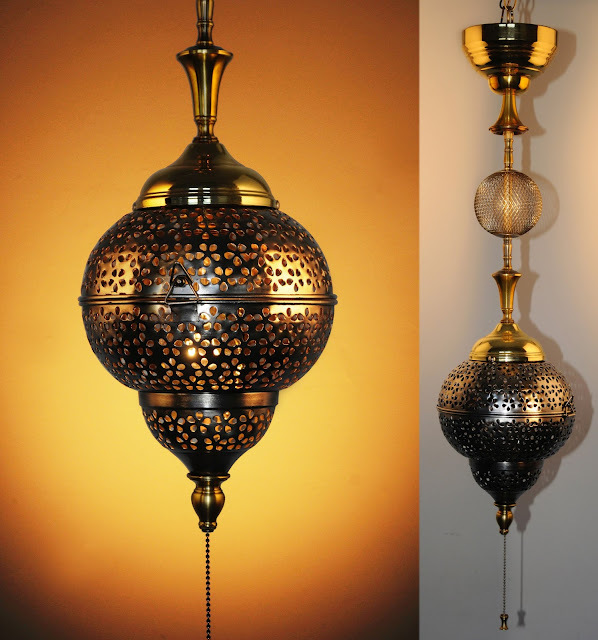 Newly created Moroccan-style pendant fixture comprised of vintage brass lamp elements and a perforated bare metal shade. Shade opens for placement of any standard 60W or Edison-style bulb. Turned off and on via pull switch suspended from base of shade. I am an artist who expresses his creativity through the design and fabrication of one-of-a-kind light fixtures. 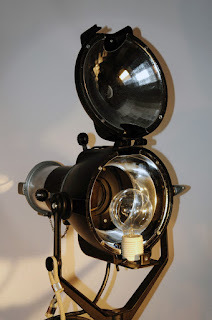 I source interesting vintage and modern lights, disassemble them, and from the multitude of pieces they provide, create new, unique, functional, and I’d like to think, visually exciting works of art. This particular chandelier is an assemblage of primarily vintage brass elements subtly blended with accents of copper and drenched with well in excess of 200 crystal prisms - each radiating with the warmth of 5 modern Edison-type bulbs. From top to bottom, it hangs at just over 40 inches but could be adjusted to accommodate a lower ceiling - its width is a maximum of 15 inches. The significant time and effort afforded in the creation of this one-off and original piece are reflected in its price - $2,900. 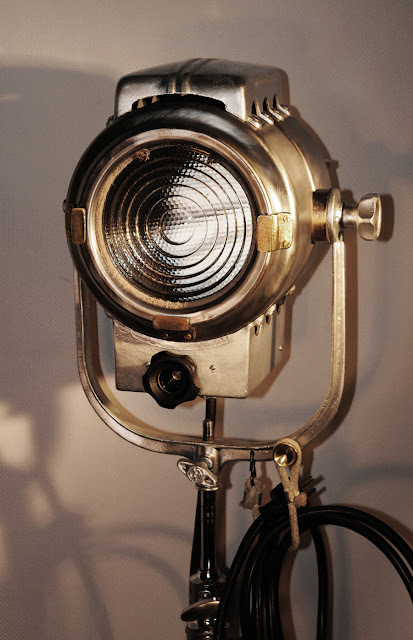 This fully functional and adjustable British studio/theatre light was manufactured by the Strand Electric Company and imported to Canada in the 1960s/70s. 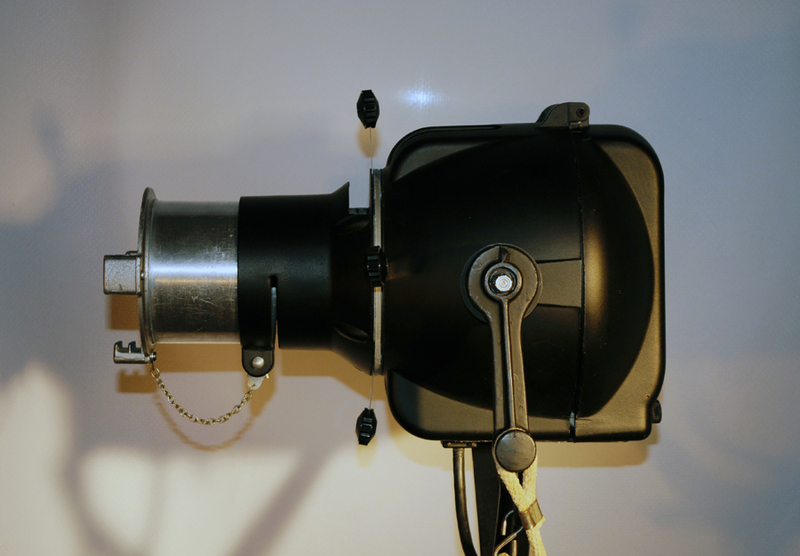 This particular unit was factory painted matt black and is newly mounted on a bare metal, American made Matthews stand. I have modified the unit by converting it to household bulb use and added a Mole Richardson support cradle with rope tie for cable storage. The collapsible, wheeled stand has been disassembled, cleaned and polished and extends upward to a height of 9ft. Strand movie lights are rarely found here with any stand. The fixture is illuminated via a new off/on toggle switch and features an adjustable, aspherical glass lens which modifies its beam from spot to flood. It has 4 movable interior baffles to control the light’s intensity. This fixture would compliment any interior whether residential or commercial - it would make an ideal reading lamp or could be used to highlight architectural features or artwork. I have another identical unit painted in factory original metallic silver - either one, $525. Just completed professional restoration of 65 year old, fully functional, totally adjustable, American made VARI•BEAM flood/spotlight. 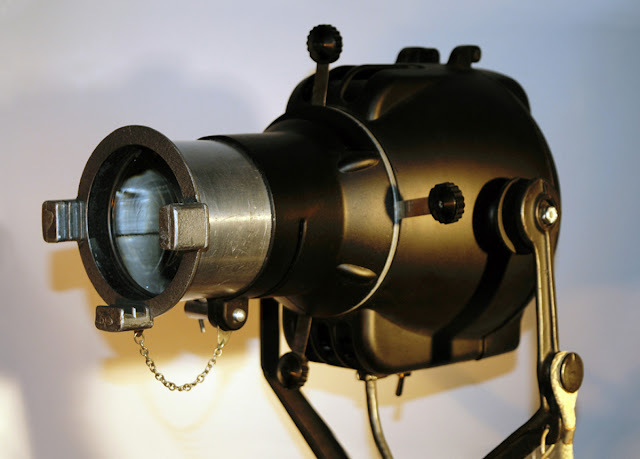 Comes replete with 6 inch Fresnel lens and levers allowing beam to adjust from narrow to wide (spot to flood). Unit is comprised of steel, aluminum and brass components and is mounted on the original, extendible (to 9ft.) chromed, wheeled stand. Fixture was completely disassembled, stripped to bare metal, polished then converted to 60 watt household bulb and reassembled. The VARI•BEAM brand (still in existence) was manufactured by Photogenic Machine Co. of Ohio. 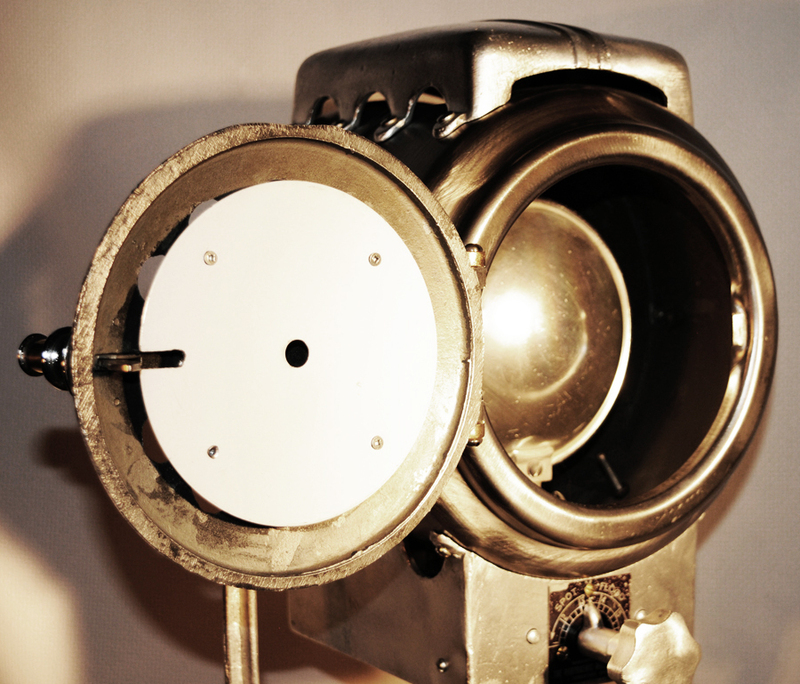 This unit turns off and on via a heavy duty, encased in aluminum 50’s era flick switch. Ideal reading light or for highlighting art or architectural features. 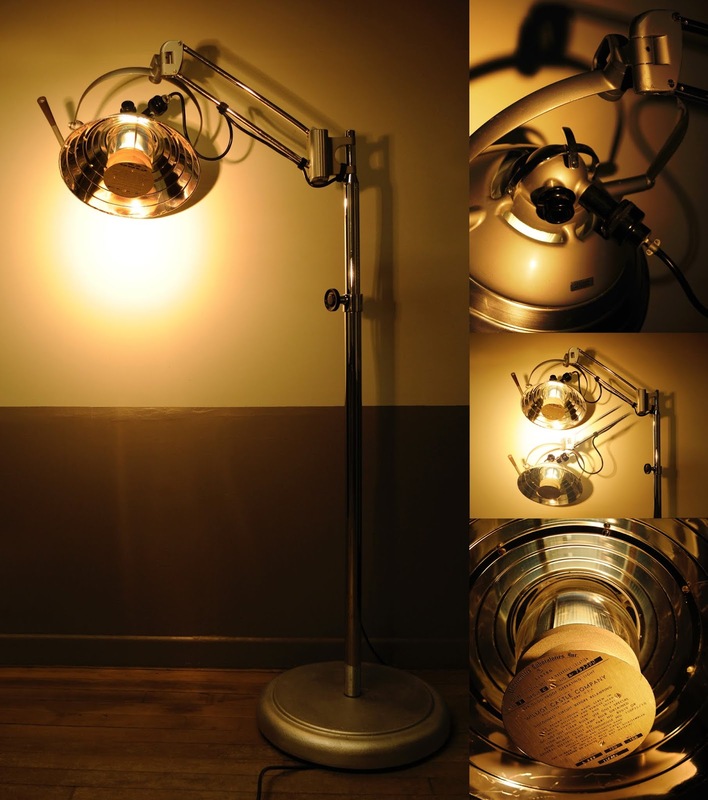 This fixture is a unique and original, vintage, articulated operating room light from a local Toronto Hospital made by Wilmot Castle of Rochester, New York. Via its many articulated joints and arms, it is fully functional and fully adjustable for height and the angle of its concentrated beam. It has a heavy metal base that rides on numerous casters with ease and it illuminates through a regular 100 watt household bulb. This lamp is of particular interest to me as, as a child, I spent some significant time at Toronto Sick Kids Hospital which, as indicated on one of its stickers, happens to be where this light served its purpose. I like to think that it had potentially been the one that helped me through that period of my life. 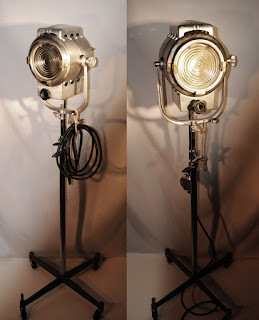 An identical unit is listed on Etsy for $1000 American - this one is a lot less than half of that at $485 Canadian pesos. The focal point of this newly completed chandelier is its crackle-finished, 10 inch art glass globe. 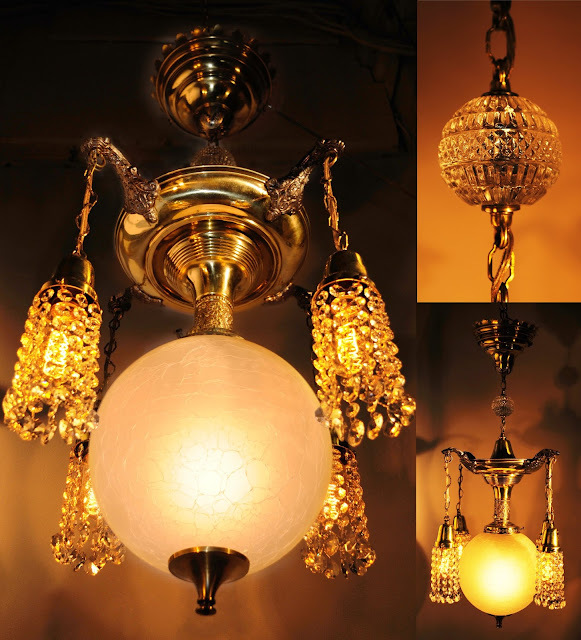 It is suspended from a hand-fabricated assemblage of vintage brass light fixture components including four ornate arms from which hang, by decorative chain, 4 brass shade holders and 48 strings of genuine Swarovski crystal prisms all illuminated by 4 gold-hued Edison-type bulbs - the globe being lit by a single standard 60 watt unit. This primary element of the lamp is suspended by chain link from a cut glass ball and directly above it, an equally handsome brass canopy. The total length of the fixture measures 36 inches with a maximum width of 19 inches. All electrical elements are new. All brass has been polished to a fine gloss as indicated by the photos below. 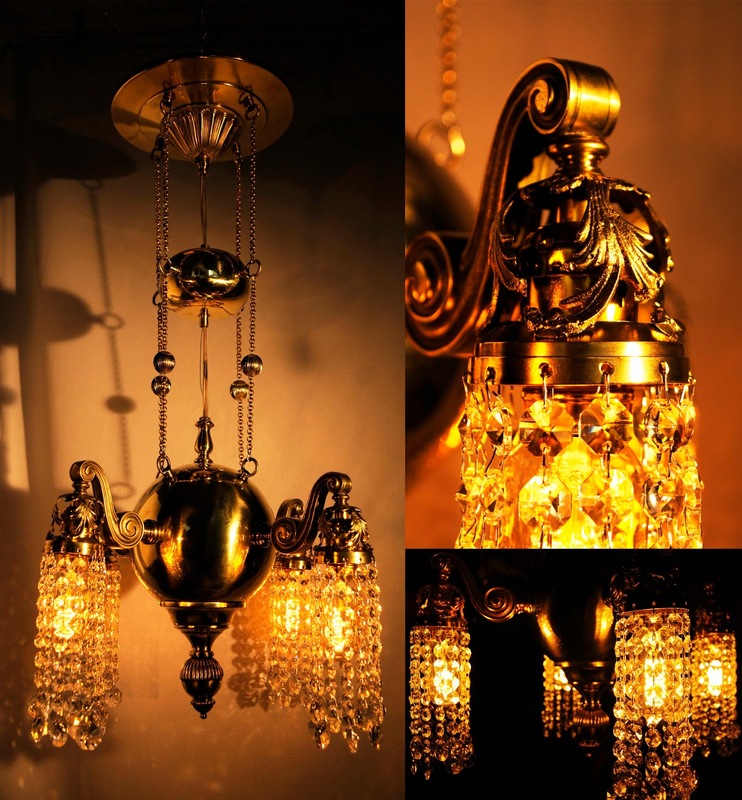 The primary portion of this recently completed piece was taken from a solid brass, 50’s pendant comprised of a large orb with sculpted arms and leaf-ornate shade holders. Its original glass shades have each been replaced by 12 individual strings of Swarovski prisms which now surround 4 vintage-style Edison bulbs creating the impression of cascading crystals of ignited ice. 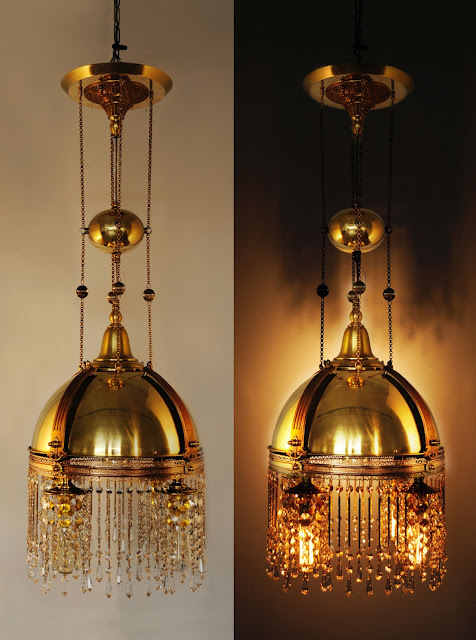 Hand-polished to a gloss, this element of the fixture is suspended from a smaller brass oval ball by lengths of decorative brass chain which, in turn, hang from a large diameter, equally ornate canopy.